It was very, very clear that the team did not get my memo. I specifically said that we need to play better baseball, baseball that was more appropriate and commensurate to the stage on which we currently find ourselves, namely the World Series. That means that we need to be at our absolute very best, and it was quite obvious from last night’s performance that we simply weren’t. Let’s start with Peavy. His outing was great but short. He gave up two runs on six hits while walking one and striking out four. He threw sixty-four pitches. And he only pitched four innings. His first inning was his worst. He gave up a single, a sac bunt, an RBI single, another single, and another RBI single. Then he ended the inning on two quick outs, went one-two-three in the second and third, and pitched cleanly out of a nobody-out bases-loaded situation in the fourth. Doubront relieved him, pitching around his own jam in the fifth and going one-two-three in the sixth. Breslow took over in the seventh and continues to have issues. I shouldn’t have to say that this is epically the wrong time for issues of any kind. He gave up a single, hit a batter, and was relieved by Tazawa. Although Tazawa should not have given up a double, it’s also true that he shouldn’t have had to inherit runners either, both of which scored. The inning ended four batters later. Workman pitched around two baserunners in the eighth, and then we lost the game in the ninth. In order to understand the similarity in disappointment and frustration between Game Three and Game Two, we obviously have to talk about the offense. While we only sent up the minimum through three, we showed signs of life in the fourth, when Ellsbury singled and Papi walked. We finally scored in the fifth. Bogaerts led it off with a triple and scored on a force out by Carp to reduce the deficit to one. Victorino led off the sixth with a walk and scored on a single by Nava to tie the game at two. After the Cards’ two run double in the seventh, the score was 4-2, and I was really hoping that we weren’t about to lose by the same score we used to lose Game Two. Fortunately, we managed to tie the game at four in the eighth. Ellsbury singled, Victorino got hit, Pedroia grounded out and moved both runners into scoring position, and Papi walked intentionally to load the bases. 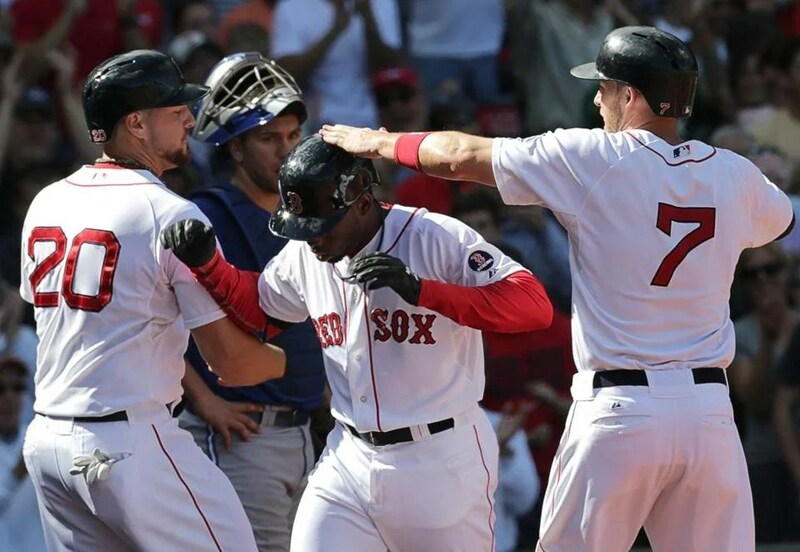 Nava grounded into a force out to score Ellsbury, and Bogaerts singled to score Victorino. That was very small ball in a bases-loaded situation; that wasn’t exactly the blow-this-game-wide-open scoring play that I was hoping for. But it allowed us to pull even, and we took what we could get. That brings us back to the ninth. We went down in order in the top of the inning and were hoping to force the game into extras. Workman recorded the first out of the inning and gave up a single, and Uehara came in. Uehara, as we all know, has been exceptional in the closer’s role. Exceptional. So it was not unreasonable to expect him to take us into extras, where we’d figure out a way to win, big hits or no big hits. He gave up a double. By itself, a double is no big deal. And giving up a double in that situation, since there was only one other baserunner, was not, by itself, a problem. It became a problem because Middlebrooks committed interference at third. Uehara’s next batter had reached on a fielder’s choice. The first runner was successfully thrown out at home, thanks to one of Pedroia’s signature diving catches. Salty then threw the ball to third because he saw the runner trying to get back there. But it was a bad throw, and in Middlebrooks fell down trying to make the catch. He didn’t end up making the catch, but apparently he did end up impeding the runner’s path home. So Middlebrooks got caught up with the baserunner, and soon he was just running toward home. Fortunately, it looked like it wouldn’t matter because Nava made an excellent throw home. 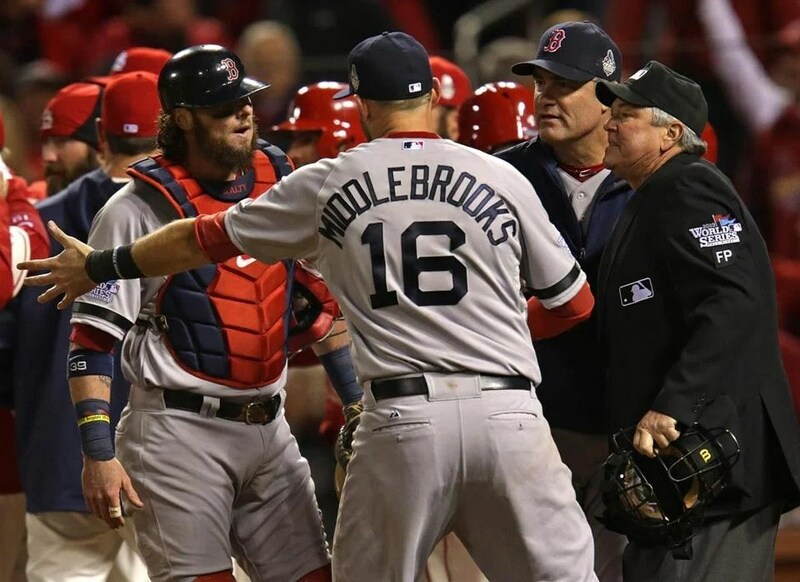 But third base umpire Jim Joyce ruled Middlebrooks’s actions an obstruction. And we lost, 5-4. It’s always possible that that call was debatable. In my opinion, umpires have to be very, very careful not to affect what is supposed to be a game’s natural outcome. And while there are rules on the books that explain and determine what is and is not obstruction, one also has to consider the fact that it’s also possible that Middlebrooks did the only thing he could do given the circumstances. Salty threw the ball; it wasn’t a great throw, but Middbelrooks still had to catch it. And he did the only way he could do; he can’t be expected to simply not try to catch a ball, and there was no way out of that situation. The whole thing was a complete mess. I don’t recall having seen a play so messy and confusing, especially not during a postseason or a World Series. I was too devastated after I understood that it had cost us the game to register what had happened, but after I saw it on replay a few times I was able to add some fury and outrage to that devastation. Losing because it’s blatantly all your fault is a really hard thing to accept. Losing based on a called play that can be questioned, especially during the World Series, is undeniably infuriating. Of course, Joyce explained later that rules are rules, whether or not there was no alternative for Middlebrooks. But to have the entire game decided on a play like that is just really, really hard for me to get on board with. It’s bad enough that we lost. It’s even worse that we lost during the World Series, on a walkoff on the road no less, and worse still that this has created a 2-1 series deficit. But I also am really uncomfortable with the fact that we lost our second home game and have now lost our first away game. We’re supposed to be the team that doesn’t let things like that get to us. We’re supposed to be the team that can reestablish our momentum anywhere and carry it with us anywhere at any time. I don’t care that now we’re stuck on the road. We have no choice but to pick up, and fast, in St. Louis. In other news, the Bruins lost to the Devils, 4-3. I guess Detroit got mad. Like, really mad. One of the reasons why the games have been so close is because we’ve sent out some seriously awesome pitching. But we didn’t have it last night. Last night, it was absolutely awful. 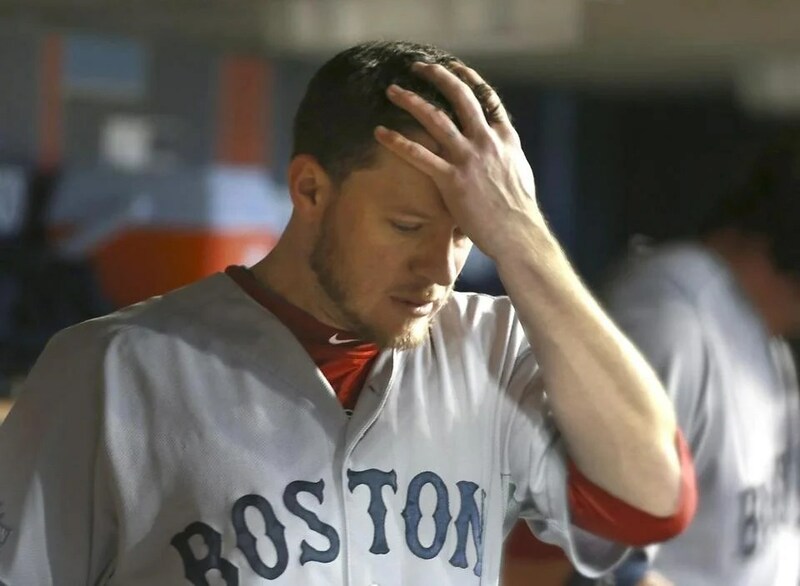 Peavy had them down for the first and then gave up five in the second inning alone. He gave up a single and two consecutive walks to load the bases with nobody out. Then he induced a flyout and allowed the game’s first run using one of the more humiliating methods: the bases-loaded walk. He then induced a force out that scored another run, and he gave up a two-run double and an RBI single. It was pretty ugly. And it got worse in the fourth. He gave up a double followed by an RBI single. Then Workman came on, ending a bizarrely horrid outing by Peavy. I was not expecting this. Peavy has been very impressive, and all of a sudden he just wasn’t himself. Anyway, Workman recorded the inning’s first two outs and then gave up another RBI single. Meanwhile, our offense was coming up short. We had baserunners, so it’s not like we had no opportunities. We just couldn’t come up with any timely hits. Until the sixth. Papi flied out to lead it off, and then Napoli, Nava, and Salty hit three straight singles that scored one run. 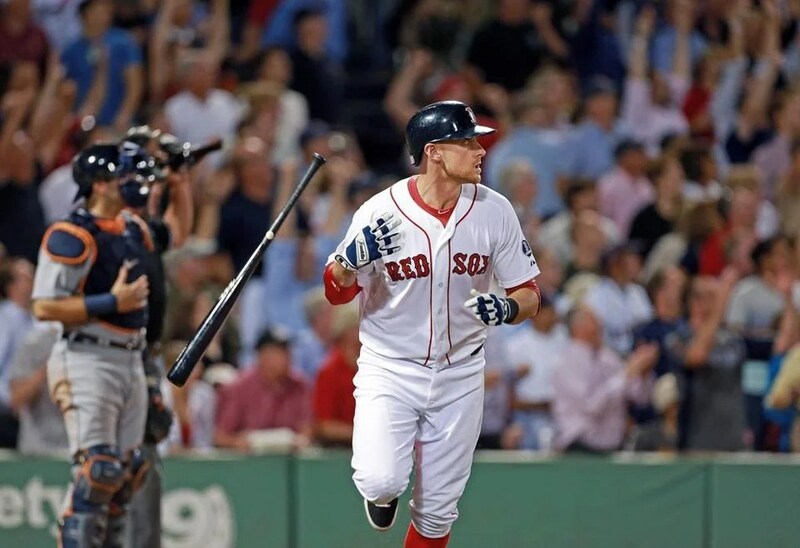 Then Ellsbury led off the seventh with a single and scored on a double by Victorino. And then Bogaerts doubled to lead off the ninth and scored on a triple by Ellsbury. Needless to say, it wasn’t enough. We were away, so we’d have had to at least tie it, and we most definitely did not. The relief corps did a great job; Dempster pitched the sixth, and Morales pitched the seventh. Doubront pitched the eighth. And we lost, 7-3. Well, that’s a wrap! That, my friends, is officially a wrap. The 2013 regular baseball season is now over. That’s it. We finish with a record of ninety-seven and sixty-five. That’s good for a winning percentage of .599, which is the best in the American League and tied with the Cards for the best in the Majors. Look at how far we’ve come. New manager, new players, new team. And new record. Better record. Look at how far we’ve come. Look at all the changes we’ve made and the transitions we’ve gone through. And we made it on the other side. Not to say I told you so, but I knew good things were in store for us from the very beginning. And in this particular case I’m so psyched I’m right. We ended the season, unfortunately, with a loss. But the pitching staff got some last-minute work in while Lackey got the day off, which is good. Webster pitched three shutout innings to start us off. Doubront took over in the fourth but got into trouble in the fifth. He gave up two singles followed by a strikeout and a walk to load the bases. A double, a single, a walk, and a single ended up scoring five runs. Then it was De La Rosa’s turn. He ended the inning and gave up a single in the sixth. Dempster took over and gave up a double, a wild pitch that scored a run, and a groundout. Dempster came on and, while ending the inning, also gave up an RBI double. Breslow pitched the seventh, and Uehara pitched the eighth. The game started very nicely with a solo shot on the fourth pitch, courtesy of Ellsbury. It was his third cutter of the at-bat, and all four pitches were about the same speed. But he hit this one beyond the fence in right center field. And he looked comfortable doing it, too. It’s his third leadoff shot this year and tenth of his career, which is a new club record! After Bogaerts struck out, Papi singled and then scored on a groundout by Carp. With one out in the second, John McDonald singled, and Quintin Berry went yard on a changeup to right. So the pitchers were taking this opportunity to get their work in, and so was the bench. Which, as we all know, is very important. Salty singled and scored on a single by Ellsbury in the fourth. And Papi singled and scored on a single by Napoli in the ninth. So we lost, 7-6. But that’s so opposite of everything we’ve accomplished this year. I’m so proud of us. Now, this moment is really all about us. But I want to say one thing. The New York Yankees will be missing the playoffs this year. Wow. Life is good. Okay. So. The whole team gets the day off on Monday, when the Rays and Rangers play for the final Wild Card spot. Whoever wins will play Cleveland. Then the division series will start on Friday. The first two games will be at home, followed by a day off, then two games away, and then the last game would be back at home. Oh, man, it’s good to be back. Let’s get this done. In other news, the Pats bested the Falcons, 30-23. At least this series wasn’t a total loss. In fact, we ended up winning it. It’s always nice to end a series and a weekend on a high note, especially going into an off day. This is the third of four off days we have in this month alone, but it’s a nice schedule before heading into the playoffs. We’ll need to save up a lot now that our season has been extended. 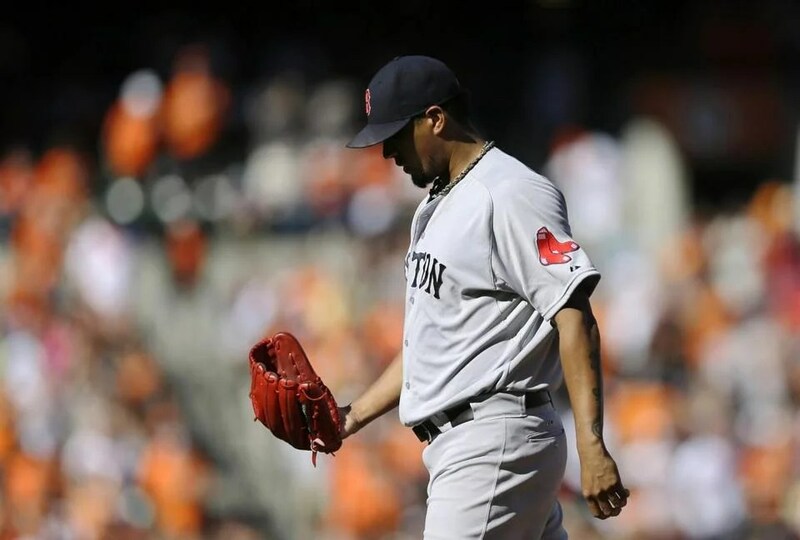 Doubront pitched fantastically, giving up only two runs on four hits in seven innings. It was great. He gave up a run in the second thanks to a walk and two singles, and he gave up a solo shot to lead off the fifth and that was it. Other than that, he looked like he was in complete control of the situation. Morales, however, did not. He almost got himself into trouble. Scratch that; he got himself into trouble and then managed to get himself out of it. The same can not be said of Uehara, who came on for the ninth and didn’t get himself into trouble in the first place. We actually were down by one going into the bottom of the second, which Carp led off with a flyout. Then Nava singled, Middlebrooks flied out, Drew singled, Nava scored on a single by Lavarnway, and then everybody came home on a blast by Bradley on his second pitch of the game, one of two knuckleballs of the at-bat. He took the first one for a ball and launched the second one beyond the right field fence. That was it until the sixth, which Papi led off by doing almost the exact same thing. He went yard on his first pitch, also a knuckleball, which he also deposited beyond the right field fence. So the final score was 5-2. Both teams collected six hits each, but you really have to be careful when throwing knuckleballs. I believe that this game has officially illustrated the following fact: just because you’re a knuckleball pitcher doesn’t mean you’re Tim Wakefield. By the way, I’m glad Yaz finally has a statue. It’s about time. In other news, the Pats absolutely crushed the Bucs, winning 23-3.